Zing go the strings: Another season of dunks, flops and depressed Knicks fans is nearing its conclusion. To celebrate, we're bringing you seven more ludicrous basketball cards to match the number of steps LeBron can take before the refs call him for traveling. We'd say "Enjoy!" but that's probably a reach. 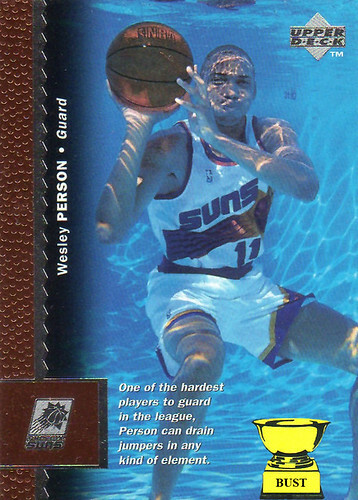 The wisdom of Upper Deck: As noted on the above card, Wesley Person could make jumpers in any kind of environment, apparently including while wearing a basketball uniform underwater. Here are a few shots of Person in assorted environments that didn't make the cut for this card.